We are planning on getting a trailer for the C-22 and wanted to get some input from everyone here. I have 3 different ideas for getting a trailer... 1. Buying a new one, called for prices and am waiting on some quotes from a couple trailer manufacturers now 2. Buying a used motorboat trailer, building new bunks and moving the axle(s) forward to the correct CG 3. Building my own, then having it galvanized. First one is least labor intensive... well aside from having to go to work every day to pay for it! Second option is easier on the wallet, but requires some effort to ensure road-worthiness. And third option gives me plenty of creative license to option it how I want, but will take the most time. I know that Chrysler trailers were originally single axle, but that quite a few people have them on tandem trailers. I want to know how they trail in either configuration? Give me ideas here please! If you look around on e-bay and the like you may find a suitable trailer, but then you may need to drive half way across the country to get it. I know new trailers are a bit pricey but you don't need to purchase new brakes, tires and no need to replace old rusted out parts. 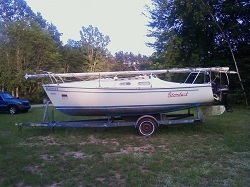 If you plan on keeping your boat for a good while and can manage it... go for a new one, just my way of thinking. Oh and yes the same argument goes for the motor. All the above is just wishful thinking on my part. I have an OEM trailer and a single axle trailer non OEM. I can not speak for the OEM since I've only towed about 30 miles on bad tires. However my single axle trailer under Lady Jo tows very nicely. No issues at all. I towed it with a Ford Explorer and my F150 long bed. I can tell you the longer the tow vehicle the better she seemed to tow! Last fall we took her to Easter Wa about 4 hours from my home over a mountain pass from sea level to over 4K feet elevation and all was very very well. I will admit though I'm pretty dang conservative when towing. I like the idea of new also if you can swing it. same as hp18carr. If you plan on keeping her a long while, just do it right the first time! Depending on where you launch and what your tow vehicle is, you may need a tongue extention. I concur on the tongue length issue - EE's trailer is an old powerboat trailer with a standard tongue. Last time we launched her it required a bit of work to float her. "Work" as in we wet the bunks with a hose to slick them up, then backed down the ramp as far as we could, then pulled up, and backed up again slamming on the brakes to fling her off !! Retrievals are worse !!! My C22 sits on an oem single axle trailer. I tow it short distances with a Jeep Liberty. I have towed it behind my motorhome to the Florida Keys about 3,500 miles round trip. Other then a broken hub and lost wheel it was a great trip. Now it sits on a new axle and I wouldn't think twice about hauling it across country on the sinlge axle trailer it tracks great. I use the tounge extension every time I launch. EmergencyExit wrote: . . . .then pulled up, and backed up again slamming on the brakes to fling her off !! Retrievals are worse !!! Where is the YOUTUBE video ???? In a very safe place I like to call my memory.. I would say if you can with a 22 stay with a single axle unless your driving is straight line as when you corner you drag one axle sideways which is rough on tires and wheel bearings. I do not have the option on the 26 I have to have tandem for the weight. every year I change the tires front to rear axle and look at bearings and brakes every spring as I have alot of turns and when I put her in the back yard I have it turned before I hit the grass (a lesson learned at the school of hard knocks). and I would like to see that youtube video as I cannot fling my 26 off as the keel does not fit between the rollers I am thinking of changing to bunks. I bring My Getaway in and over the trailer fender if I try to go over the rollers my Dakota has the front tires in the water. People see me bring it around the rollers and point and laugh but it comes right out and their chins are on the ground. I have launched twice and retrieved once so far in the past two years. Each time I had the trailer tongue extender maxed out and my Ford F350 in the water past the back wheels. Sometimes to the front wheels depending on the depth of water. I have the original Chrysler brand trailer that came with the boat. My bunks are curved upward front and rear to support the curvature of the hull, which means the boat will float before it is high enough to clear the rear of the bunks. My fabricator buddy and I plan to install 1" all thread rod at the rear of the bunks with an adjustment nut so that we can increase the clearance by 6" or more when launching and retrieving by lowering the curvature out of the bunks. I am going to the Outer Banks next month, and decided the trailer needed some work. With a boat that arguably weighs 3000 pounds empty and the trailer itself, you have maxed out the tires' load carrying capacity before you even add in a motor, fuel, water, accessories, food, etc., etc. With this in mind and about 22 hours road time ahead of me, I elected to add another axle. I am removing the 4' long angle which the spring perches are welded to and replacing them with 8' long pieces. The center equalizer of the tandem axles will be placed exactly where the single axle was before. Having pulled a lot of heavily loaded Bobcat and backhoe trailers, I feel much better with four tires instead of two. Having also experienced a flat on tandem axles one remembers that due to the equalizer device merely removing the flat tire and wheel does not provide clearance for the hub not to drag pavement. We are building a little connector link which will slip over three lug nuts and attach via boltholes located over all four hubs. If we have more flats than spares, this connector link will hold the axle with the flat in the normal traveling position even without a wheel on it. I will trade some tire scuff while manuevering for the piece of mind of the extra load carrying capacity. My 7.3 Powerstroke doesn't care if the trailer even has wheels or not! It's always best to tow with more capacity and more horsepower than you actually need to do the job. The equipment has much less stress on it and will last a lot longer. At least that's always been my philosophy. 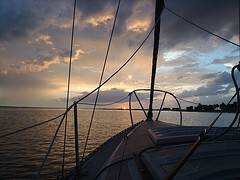 lecker68 wrote: I cannot fling my 26 off as the keel does not fit between the rollers I am thinking of changing to bunks. lol, I guess a better description is ejecting it off the back of the trailer rather than flinging it. Our ramp is pretty steep and what happens is the stern will start to float before the bow will. EE has short flat bunks that pretty much go along sides of the keel..so a little momentum and a sudden stop usually does the trick.. The ramp is also perpetually covered in algae until the water is deep enough to stop sunlight. You do not want to put a rear wheel drive on that slime for sure.. I have a single axel and from now on will use the tongue extension. I did manage to bend the trailer this spring by a combination of the wrong ball size, not using the extension and jumping on the tongue to try to get the boat to come off and into the water. The whole episode ended by me un-hooking the safety chains and riding the trailer down the ramp. Would have made great video on how not to launch a boat. We were able to repair the damage by blocking the rear of the trailer and bending the tongue back by once again jumping on the tongue. I then had a friend weld braces on the trailer.The trailer was bent so bad that the extension pins would not line up and could not be used. Another word of caution put the pins in otherwise the trailer will get longer as you take off from a light and get shorter when you stop. (lol) Paint will cover a multitude of sins! Pictures when I complete the repair in a few days. My two cents; get a trailer with a tongue extension and use it. EE I can only picture the ejecting if the rudder is straight as it will act as a brake. I can agree on the algae being slippery my ramp would be better if it were a little steeper. The earth is 75% water,can you sail? Thanks for all the input guys. Oddly enough, I'm leaning toward option #3, building my own trailer. Partly because i got some quotes for trailers, $2500 for a galvanized single axle without brakes... OUCH! Partly because buying a used motorboat trailer will take almost as much effort to reconfigure, and then to make as good as new in the mechanical parts department and refinish it. For about $15-1700 (more than I paid for the boat, haha), I can build a tandem torsion axle bunk trailer with surge brakes and a washdown system. Oh, and an extension tongue!!! 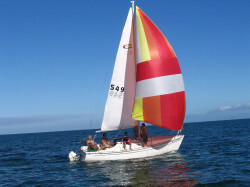 All of our sailing will probably be in salt water, so a rinse system is invaluable. I think tandems are safer as a few of you said, and we have plans for some extensive trips that I would feel safer have 4 wheels on it. Funny launch stories guys, Our boat is docked at the marina right down from the ramp. It's hilarious watching people launch and retrieve the boats sometimes. I have seen people drive their trailers over the wall, launch boats right into the piling behind the ramp, etc. 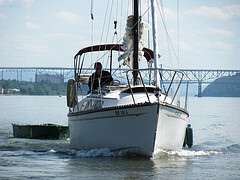 Almost always motorboats launching there, have only seen 2 sailboats since we have been there. Sent you a PM asking about the teflon additive. Have you tried it yet? Any advice? Also, very much looking forward to your trailer build! Interested in that washdown system you mentioned. Tell us more and PLEASE shoot us lots of pics as you build this thing!!!! Well, after all that planning and almost ordering some parts, we found another Chrysler 22 on Craigslist. Heading out to look at / buy it now. Price is great and has a tandem trailer and engine. Needs keel brackets due to a leak but that doesn't scare me at all. I'll post pics later tonight.